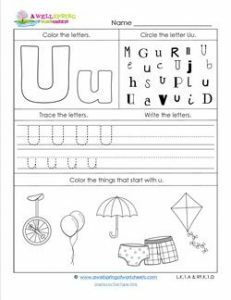 This alphabet worksheet for the letter u provides all kinds of smart ways to practice and recognize the letter u. First, kids can color the upper and lower case letter Uu. Next, they can find all the u’s in the box. Hint: There is one upper case and one lower case Uu in each row. Then kids can trace each Uu and write at least three more on their own. Kids love to sound out words and listen for the beginning sound and that’s just what they can do in the last section of this worksheet.